I bumped into a very disturbing story and a picture on some news outlets this evening, which necessitated my will to write this piece and advise President Muhammadu Buhari on the need to be politically cautious of such actions. In the picture, President Buhari was in a ceremonious mood with his brother-in-law and Adamawa Guber aspirant, Mahmoud Halilu (Modi) after the later picked his expression of interest and nomination form to contest for the Adamawa governorship in 2019. Under contrary circumstances, there is nothing wrong with President Buhari taking such picture with his brother-in-law but it is case of the in-law wanting to run against a man that is more like a son to the President himself, a man that has contributed so much to Buhari’s 2015 & 2019 aspirations, a man who is a loyalist of the President and a man that has transformed Adamawa into a progressive State – Senator Muhammadu Jibrilla Bindow. It is an established fact that Adamawa State Governor, Bindow is one of the very few governors in Nigeria who is wholeheartedly committed to President Buhari’s continuity course come 2019. Bindow has continuously worked for the success and progressive of Buhari’s ideals and politics in the state. 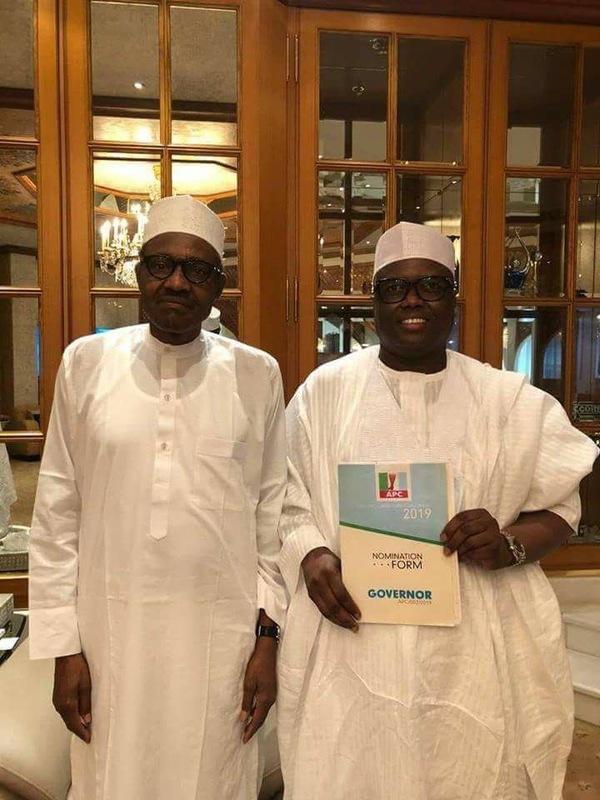 Therefore, it is baffling that President Buhari will agree to such kind of picture with his brother-in-law which may be mistaken for a support stamp to Modi’s aspiration to the detriment of a loyalist like Bindow and all well meaning individuals in the APC will feel bad about that picture because as it is Modi is not even a candidate the President will want to be associated with. The relationship between Bindow and the President has always been warm and amazing. Bindow is known to be more like a son to the President for marital, political and many more reasons. Sani Zangon Daura, Bindow’s father-in-law is a long time and trusted acquaintance of President Buhari – when Buhari seeked the hand of Mrs Buhari’s for marriage, it was Zangon Daura who was his shield and pillar for the marriage. It is however a big shock that President Buhari will take such a picture with one family member – Modi, who intends to contest against another family member and the people’s choice – Bindow. But the warning signs of this misdemeanor came a while ago, when the wife of the president during one of her visits to Yola for a ceremony of her Future Assured Project uttered that come 2019 – ‘Naka sai naka’, which means ‘yours should be yours’. It is surprising how easily Mrs Buhari will forget her close acquaintances with Bindow’s family and In-laws to make such politically reckless statement in public. On this note, I wish to clearly advise the President to as a matter of urgency disassociate himself from Modi’s candidacy and clear the air on the circumstance of this picture. 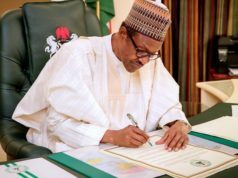 President Buhari should be a father to all aspirants close to him in his party, this is no time to tilt towards an aspirant especially an unpopular one like Modi – who is not even fit to win a councilorship seat in Adamawa State. These are the same mistakes Buhari made in 2011 with his self-founded party, The Congress for Progressive Change (CPC) in Kano, Kaduna and Katsina when he tilted to the aspirations of less popular aspirants to the detriment of what the public wants – we all know what happened then. It will be unfortunate if such bad history will repeat itself in Adamawa come 2019. Bindow is not perfect and he has his shortcoming as an administrator but the man’s achievements and contributions to the development of Adamawa state is part of the strongest points for his party’s campaign and still is a reference by the APC. His government was prided by many Nigerians as “the face of good governance in Nigeria.” His performance over the last few years won him many accolades. I also wish to state that despite the big political witchhunt and distractions from the opposition and some people within the party, he has not lost focus of the real essence of governance, especially in the area of improving the lives of the citizenry by ensuring delivery of infrastructural development that will affect the people both directly and indirectly in Adamawa State. Even in the midst of crunched economy, scarced resources and technical recession, Governor Bindow has improved the living condition of Adamawa people through laudable and human development oriented projects. If there is one man who deserves such an open tilt to his candidacy from President Buhari, it’s Bindow. Mr President, in politics, blood relations and marital acquaintances matters less, what matters most is the will of the people and what the voters want. It will be disastrous for your popularity and good name if you try to impose any candidate on the people in Adamawa State or any other State as at that. Once again, I wish to advise you disassociate yourself from Modi’s aspiration in Adamawa State and issue a clear up on that picture before more damage is done. 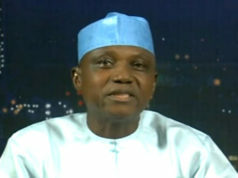 God bless you and God bless the Federal Republic of Nigeria. Previous articleADAMAWA 2019: MODI CANNOT WIN ANY ELECTION IN ADAMAWA STATE.